Barcelona coach Ernesto Valverde said on Friday he will be wary of Malaga's strong recent record against his side when La Liga's basement club, who have only taken one point from their first eight league games, visit the Nou Camp. Barca, meanwhile, are flying high at the top of the standings, with seven wins from eight and a perfect record in the Champions League, but have struggled in their last few meetings with Malaga. Last season, Barca lost 2-0 away in April in a game which had a large say on them missing out on the Liga title to Real Madrid. They also were held to a 0-0 draw when Malaga visited the Nou Camp in November. Barca only scraped past Malaga the year before and were beaten 1-0 at home in 2014-15, the same campaign when the Catalans won the treble. "It's something we have to bear in mind and we need to analyse what has happened (against Malaga)," Valverde told a news conference on Friday. "We don't know if it's a coincidence or not, but Malaga have always done well against Barcelona, regardless of who their coach has been. They usually suffocate Barca and they come here in desperate need, with only one point." Malaga coach Michel is in serious danger of becoming the fourth manager in Spain's top flight to lose his job this season due to his side's terrible record, while Valverde has thrived since succeeding Luis Enrique earlier this year. President Josep Maria Bartomeu heaped praise on the former Athletic Bilbao manager after the 3-0 win over Olympiakos on Wednesday, which was the coach's 100th day in charge of the 24-times Liga champions. "Everyone at the Nou Camp has fallen in love with him," Bartomeu said. "He's intelligent, he manages the games well, he has proved that everyone who believed in him was right. These 100 days have given us reason to be optimistic and ambitious." 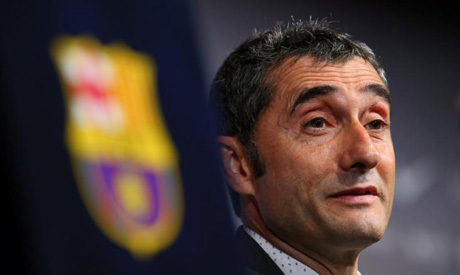 Valverde has also won plaudits for keeping his cool in what has been a turbulent three months at Barca. In his short spell in charge he has witnessed the departure of Neymar, a campaign to get president Bartomeu ousted -- which ultimately failed -- and the ongoing political standoff between the Spanish government and the regional leaders of Catalonia. "The 100 days certainly haven't been boring, I hope the next 100 are a bit more calm," added the coach.